Abra-Kebab-Ra is an online video slot game from Microgaming that has been released in August 2007. This online video slot machine game has 3 reels and 1 pay line. The theme of Abra-Kebab-Ra is inspired by the story of Aladdin and his adventures with his genie friend. 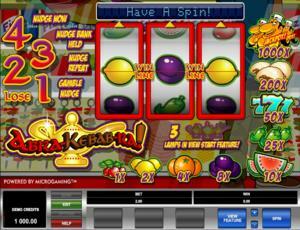 Considered to be one of the most specially-made slots games which resemble a pub slot/fruit machine more than a video slot game, Abra-Kebab-Ra is a very entertaining slot game to play at, most especially when they have included Nudge, Shifta and Hold features, which sets this one apart from other 3-reel classic slots. Most Microgaming online slot games are available in 2 formats. The first format is the one preferred by most players, which is the download format. The second format is the Flash or browser-based version, which means there is no need to download anything at all. Whether you like to download or not, Microgaming has slot games for all your slot gaming needs. Abra-Kebab-Ra is available for instant play only, so you no longer have to download anything. Give Abra-Kebab-Ra a spin and you will surely see classic online slots in a whole new different light as this one is not only entertaining, but it is also generous as it gives you many ways to win! You will definitely love to stay and play a while in the scrumptiously rewarding features of Abra-Kebab-Ra online slot game such as the Hold Feature, Nudge Feature, Nudge Bank Held Feature, Nudge Repeat Feature, Nudgel Gamble Feature, and different Hi-Lo Bonus Feature games (Multipliers, Nudges and other Bonus Feature games), and the maximum coin jackpot you can win in the regular slot game is 1,000! So, embark on an adventure to the Middle East and taste the yummy kebabs along the way while you try to find that magical lamp that will surely give you the winnings of your life! The quality of the graphics and sound provided by Microgaming software is without doubt outstanding. They possess an impeccable track record of making the most impressive graphics and realistic sound effects. A lot of online slot players love Microgaming because its online slot games have smooth animation and remarkable yet non-intrusive background music and sound effects. The slot game looks a lot like a typical pub slot game than a video slot game, but most players don’t mind much whatever it is, because for them it truly is a very exciting slot game for something that has only 3 reels and 1 pay line! The background of the reels shows different types of food such as chilis, tomatoes, cheese, salami, and kebabs. The magic lamp is displayed on the banner of the game. The background of the reels is bursting with colors of food. Abra-Kebab-Ra has been designed to have an authentic casino ambience with matching sound effects, which makes you more convinced that you are in a real casino playing an old-school slots game. The overall graphic design of Abra-Kebab-Ra displays colors such as red, orange, yellow, purple, red, green, blue, gold, white and black. There are no regular card deck symbols available in the Abra-Kebab-Ra online video slot game. The regular symbols that you will find in the Abra-Kebab-Ra slot game are the Genie, Kebab, Blue Seven, Chili, Melon, Plum, Orange, Lemon, and Cherry. There is no Scatter Symbol in the Abra-Kebab-Ra online slot game. What sets Abra-Kebab-Ra apart from other 3-reel, 1-pay line slot machine games is that it has great features and bonus feature games! It has many cool features (Hold, Nudge, Nudge Bank Held, and Shifta). It also has a fun Hi-Lo Bonus game that offers Bonus Feature games, nudges and multiplier amounts. The game also has Genie Bonus Feature games that will definitely give you more chances to win! The Hold Feature in the Abra-Kebab-Ra online slot game occurs randomly and its function is to hold the position of 1 or more reels for the next spin. When the Hold Feature is active, you will see the “Hold” buttons displayed just beneath each of the 3 reels. The Nudge Feature in the Abra-Kebab-Ra online slot game occurs randomly and its function is to allow you to bump a reel to display the next symbol. You can win up to 4 nudges per spin. The Nudge Bank Held Feature in the Abra-Kebab-Ra online slot game occurs randomly and its function is to bank your awarded reel nudges. You can win up to 4 reel nudges each spin. The amount of nudges rewarded to you is highlighted, and the Nudge buttons are enabled. The Nudge Repeat Feature in the Abra-Kebab-Ra online slot game occurs randomly and its function is that you can win the same amount of nudges used in your last spin. In the Abra-Kebab-Ra online slot game, it has a Nudge Gamble Feature wherein you can gamble your current nudges in order to win additional nudges. You can win up to 4 extra nudges. Once the Nudge Gamble Feature game is over, you are then automatically taken back to the main Abra-Kebab-Ra online slot game. The Shifta Feature in the Abra-Kebab-Ra online slot game is rewarded randomly after a spin that has no winning combination. Three Lamp symbols that appear on the reels will trigger the Abra-Kebab-Ra Bonus Feature game. You can win up to a 1,000x multiplier on your bet amount as well as other bonus prizes in the Abra-Kebab-Ra Bonus Feature game! In the Abra-Kebab-Ra Bonus Feature game, you will play the Hi-Lo bonus game. You can win up to a 1,000x multiplier on your bet amount as well as extra cool prizes in the Hi-Lo Bonus Feature game! The Hi-Lo Bonus Feature game is comprised of a Gamble Reel window and 3 Ladders (Red, Green, Blue). The Gamble Reel window shows numbers ranging from 1 to 12 with the Hi and Lo buttons. All 3 ladders have 11 levels of multiplier amounts, bonus feature games, and nudges. When the Hi-Lo Bonus Feature game is activated, a random number is shown in the Gamble Reel window. Click either the Hi or Lo buttons to guess whether the number that will be shown in the next round of the game will be higher or lower than the previous number. If you guessed the outcome correctly, you move one step up the associated Multiplier, Nudge, or Feature Ladder. Correct guesses are displayed in the Genie bonus game Hi-Lo rack. You will activate the Genie bonus game if you manage to get3 consecutive correct guesses. Only 1 selection is allowed per gamble. You are free to choose to collect a feature at any stage of the bonus game, or you can continue playing if you want to win more valuable features. Correct guesses made in the Hi-Lo Bonus Feature game will move you up to the Red Multiplier Ladder. You can win up to a 2,000x multiplier value on your bet amount! Should you wish to collect this feature, your overall bet amount is multiplied by the multiplier value you’ve won. The range of Hi-Lo multiplier amounts are: 1, 2, 4, 6, 8, 10, 20, 50, 200, 500 and 2,000(x) times! Nudges that are accumulated while playing the Hi-Lo Bonus Feature game are allocated random cash amounts. You will not be able to collect the Nudge Feature if it does not have a cash amount. If you collect the nudges that have a cash amount, you are taken back to the reels where a win (that is equivalent to the allocated cash amount) is nudged in. You can win up to 50 nudges! The range of Hi-Lo game nudges are: 1, 2, 3, 4, 5, 6, 8, 10, 12, 20 and 50. The Green Ladder consists of Bonus Feature games, which will really help you increase your chances of winning. Correct guesses in the Hi-Lo Bonus Feature game will boost you up the Green Ladder. Abra-Kebab-Ra! This is a guaranteed win feature. Three lamps with multipliers are shown. The multiplier amounts are concealed and the lamps are moved around. Click on a lamp to unveil its multiplier amount. The Genie will then carve the doner meat to unveil paytable symbols. The payout for each symbols is going to be multiplied by the lamp multiplier you have won and your bet amount, and then added to your winnings. The feature will end when the Genie stops carving the meat. Kebab-A-Rama! This is a stop and win feature. You can win up to a 1,000x multiplier on your bet amount. This is played on the payout table which is composed of 9 levels. Each level contains a multiplier amount. Click on the Stop button to stop the flashing symbols on a multiplier amount. Your bet amount will be multiplied by the multiplier amount you’ve won. The Repeater is a random feature that lets you win this payout again. You can repeat this feature up until no more repeats are given. The Spice is Right This is a Gamble reel-based feature. If you choose this feature, the Gamble Reel will spin again and stop at a random spot. The numbers shown in each window are added altogether and then multiplied by your bet amount. The value will be paid out as your bonus prize. The Repeater is a random feature that lets you repeat this feature and win extra bonus prizes. You can repeat this feature up until no more repeats are given. Turkish Delight This is a reel-based feature. You are taken back to the main Abra-Kebab-Ra online slot game. A sequence of random wins is shown consecutively on the reels. You will win the sum of all the wins shown. Lamb, Bam! Thank You Mam! You can win additional random multipliers. You stop the flashing numbers. The number you stop on determines the number of shots rewarded. You can re-play the bonus feature, but that depends on the number of shots you were rewarded. You stop the flashing multipliers. Your total bet amount is multiplied by the multiplier amounts won. Kofte Up The Cash This is a reel-based feature. If you choose this one, you are taken back to the main Abra-Kebab-Ra online slot game. The symbols at the outer part of the reels begin to flash consecutively. Click the Stop button to stop on a symbol. The symbol you get will complete a winning combination. This winning symbol combination is spun in automatically. Pitta The Action This is a reel-based feature. If you choose this one, you are taken back to the main Abra-Kebab-Ra online slot game. The reels begin to spin. Click the Stop button to stop the reels in a winning line, before the reels stop automatically. A Load of Shish This is a reel-based feature. If you choose this one, you are taken back to the main Abra-Kebab-Ra online slot game. The reels spin automatically to get a random win. Round & Round This is a reel-activated feature. If you choose this one, you are taken back to the main Abra-Kebab-Ra online slot game. The reels will begin to spin automatically. Every time a Lamp symbol appears on the pay line, a payout is highlighted on the paytable. When the reels stop spinning, you get the highest payout that is highlighted on the paytable. Been There, Doner That This is a pick-a-win feature. If you choose this one, you are taken back to the main Abra-Kebab-Ra online slot game. Symbol combination winnings are shown consecutively on the reels. Click the Collect button to get one of the combinations, or you can wait for a higher win. If you do not click the Collect button, this feature game will stop automatically and will collect a random win for you. Burger Me! This is a reel-based feature. If you choose this one, you are taken back to the main Abra-Kebab-Ra online slot game. The reel symbols flash in succession. Click on the Stop button to select a symbol with the highest amount. The symbol you select completes a winning symbol combination. This winning symbol combination is spun in automatically. If you manage to get 3 correct guesses in the Hi-Lo Bonus Feature game in succession, you will trigger the Genie Bonus Feature game, wherein you can win extra Bonus Features! Each correct guess is highlighted on the Hi-Lo rack. When the Reel Bonus Feature game is activated, different features will flash randomly in the window. Simply click the Stop button to win 1 of the Bonus Features below. When the Bonus Feature game ends, the Hi-Lo rack will reset back to zero. You can re-trigger the Genie Bonus Feature game if you are able to get 3 correct guesses again in the Hi-Lo Bonus Feature game. Change Number The Gamble Reel window will spin automatically and will stop on a random number. Extra Life You are still able to continue to play the bonus game even if you incorrectly guessed the next number. Extra Step If you have not yet gone up at least 3 steps on any ladder, you are boosted to a higher spot on all of the ladders. If you have gone up more than 3 steps on any ladder, the Step button will be triggered, enabling you to spin the numbers shown on the Gamble Reel to a more favorable spot. Multi-Add You are rewarded more features that are included to your current accumulated features. No Lose You are guaranteed to get a correct guess for your next gamble. Reel Skill The Gamble Reel window will spin automatically. You stop the Gamble Reel on a new number. Abra-Kebab-Ra has 3 reels where you may bet on 1 pay line. The minimum bet is 0.10 and the maximum bet is 10.00 per line. You can wager 1 coin only per pay line. Thus, the minimum bet amount is 0.10 and the maximum bet amount is 10.00 per spin. The maximum payout in the main Abra-Kebab-Ra online slot machine game is a 1,000x coins. Abra-Kebab-Ra does not have an Autoplay function.